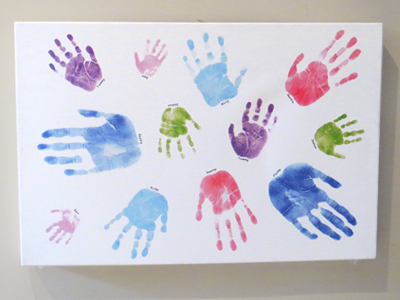 You can now turn your whole family’s prints into a stylish artform with a HappyHands canvas picture. This is a fun way to preserve the memory of the different sizes of their hand and foot prints. Once you have placed your order, we send you the special inkless foot/handprint kit sufficient to take all the prints. You take the prints and return them to us together with a description of your preferred layout and colours. The original prints will come out in a charcoal colour. We will try to get close to your desired colours. We will edit the prints and then send you an email proof. The size of the canvas will be determined by the size and shape of the prints. Once approved the canvas will be delivered within 10 working days. The minimum price is £64 +P&P, which is for up to four prints. For each further print it is then an additional £10. i.e A canvas for family of four (8 prints) would come to a cost of £64 + £40 (4 extra prints) = £104 + P&P (£115) So a total of £119.